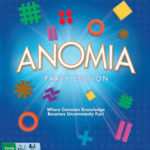 Diehard Anomia fans and novices alike will love the Anomia Party Edition, featuring 6 all-new decks and over 425 unique categories, plus customizable bank cards for adding your own categories in every deck. Play the Party Edition decks on their own or intermingle them with the original decks for hours of mad fun. Sure, under normal circumstances, it’s easy enough to give an example of a frozen food, or a dog breed; but you will find that your brain works a little differently under pressure! The directions are simple. Draw a card from the centre pile and flip it over. Does the symbol on your card match one on another player’s card? If so, you must quickly face-off with the other player by giving an example of the person, place, or thing on their card before they can do the same for yours. If you blurt out a correct answer first, you win their card and drawing continues. Sounds simple, right? Wrong! Wild cards, which allow unlike symbols to match, increase the number of things you must pay attention to. Cascading face-offs occur when you hand over a lost card. Let’s not forget your brain, your brain will betray you! All this adds up to a high-energy, hilarious play experience where everyone is involved at all times. Playing Time: One round lasts about 30 minutes. Two rounds are suggested.